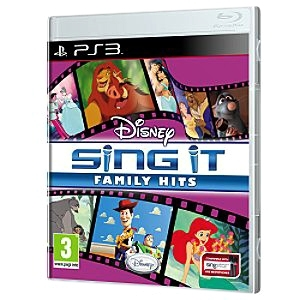 Sing along to family favorite songs and videos from beloved classics like "Cinderella," "Sleeping Beauty" and "The Jungle Book," plus contemporary favorites like "Toy Story," "The Lion King," "Aladdin," "Cars," and much more. Includes 30 tracks from classic and contemporary favorites with easy to follow lyrics. Play with friends and family in various modes where everyone can sing along, pass the mic, or showdown in head-to-head competitions. Learn to Sing It better with Anika Noni Rose, voice of Princess Tiana in "The Princess and the Frog" as your vocal coach.